It's always the first time that's the scariest. It's the idea of the unknown and the anticipation and anxiety over things. But once you've crossed that line, there's no coming back. It's the same with traveling with an infant, I suppose. I've been putting off traveling with Jaden 'til he's "old enough", simply because the thought of it scares me. I've used to be someone who (by reflex) would look at crying babies in the plane and cover my ears and try to muffle their high-pitched shrieks. On some occasion when I have had a really bad day and a tiring one, I've given them a look or two, too. Don't judge me, I want some sleep too. Hush, hush just please let me sleep, little tyke! Now, it's me on the other side of the coin so naturally, it has been a source of anxiety and anticipation on my side. I've been mentally prepared to having people look at me and give me looks, haha. The hubster and I had been planning to go for a trip to Sydney. We bought tickets and didn't look back. A week before the trip, I was looking at stuff to be brought, making a mental list of things to be prepared and asked myself, "Why are we doing this again?". Traveling with an infant - It's not easy, but it can be done. Here are valuable lessons I've learned during the trip. J with the little man at St. Mary's cathedral. 1. RESEARCH AND ASK AROUND. I'm always the prepared one when it comes to travel. I always have the itinerary plotted, apps installed, restaurants and cafes researched, addresses mapped out, transportation sorted out. It pays to ask around especially that you have to consider if the place to visit is kid-friendly. 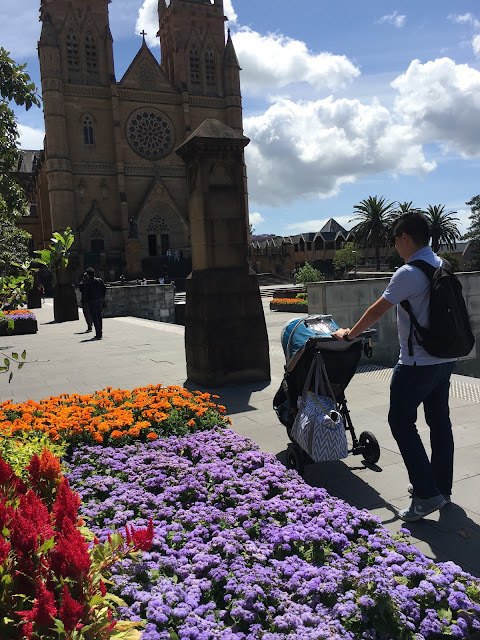 Are there ramps available for prams? Where's the nearest lift? Will there be a lot of walking? are a few of the questions we have in mind when we plan where to go to. 2. BE EARLY AT THE AIRPORT. Some airlines don't allow web checkin when traveling with an infant. This was a convenience we previously enjoyed before, though we're always one of the first few to arrive at the airport since I just want to enjoy the airport and not be too stressed running around, looking for the gate and trying to catch the flight. You never know how bad the queue can be so best be early when traveling with an infant. Consider that there'll be alot of pitstops along the way such as a visit or two to the parent's rooms. 3. BE READY TO ENTERTAIN. Little bubs tend to be bored after sitting a while on your lap during the flight. Especially our little one who wants to roll over and crawl. And since I can't let him crawl on the plane, you might need to find alternative things to keep them entertained. At first I thought I had to bring a ton of toys but realised that he gets bored of one after a period of time, too. Instead, we made do with the inflight magazines and playing with him when he got a bit bored. The pressure during take-off and landing tends to be uncomfortable to ears, especially to little ears. Have milk, water, food, dummy handy to get them sucking/chewing to help relieve the "ear popping discomfort". Time flies faster when you have a bub to take care of. There will be napping, eating and nappy changes on the go. Make sure you account for that during planning. With that said, you may need to drop or forego some items in your list. 6. HAVE A BACKUP PLAN. Plan B isn't a bad thing. Or C, D... Make sure you have alternatives. Don't set your itinerary in stone - be ready in case you need to change plans to accommodate the baby. Be prepared in case of unexpected weather changes or when bub needs to go down for a nap. In our case, we had to forego going to the beach because of the limited time and the long bus ride, plus the lack of pram-accessible ramps. 7. Two P's: PATIENCE and an awesome PARTNER. For me, traveling with a bub is this: the more hands, the merrier. I'm blessed to have a husband who does his fair share - we are indeed a team when it comes to Jaden and traveling with bub was no different. When I get overly tired, stressed or anxious, he gives me time to go get a breather and recompose myself. It pays to have him as the "muscles" of the trip, I just couldn't imagine doing everything all by myself with all the stuff to carry, assemble and a matching baby to boot. Going out with a bub is a grand production. Traveling with a bub is a much grander production. So many stuff to bring for such a little person. Bottles, steriliser, clothes and extra clothes, food, toiletries, portacot, pram and so on! As tempting as it is especially for me who tends to be an over-packer and who wants to prepare for the rainy days, it's best to prioritise what to bring especially with limited luggage allowance. It sometimes means not bring a lot of my clothes and beauty stuff too, when it comes down to it. 9. LIGHTEN UP, HAVE FUN. There's no point being stressed and anxious, just enjoy the experience. It'd be something you'd look back in a few years time. They won't be little ones forever, you know. And oh - about crying babies in the plane: little one was all smiles and laughs. He was having a giggle fest - so yes, we had "looks" from other passengers but it were looks of amusement and fun. His wee giggles told me what I needed to know - he probably has the travel bug too.